Whether one examines democratic or nondemocratic regimes one thing is certain: all governments need to legitimize themselves. As Gramsci and others have stipulated, legitimacy derives not merely from the effective enforcement of the rule of law or the menacing mechanisms of repression regimes have at their disposal but also from the dissemination of values that eventually become hegemonic. In the case of democracies, this verbosity manifests itself in great part by conveying the efficacy of public policies, the accountability of elected officials, and from such democratic mechanisms as valid election results, transparent electoral campaigns, widespread popular participation, and the toleration of dissent. Nondemocratic regimes, especially Communist ones, on the other hand, hide the veil of oppression behind controlled political mobilization and a carefully crafted public communication strategy deciphering Socialist rule as the determined path of historical development. The case of Cuba provides us with an opportunity to examine the central concern of this study. How do authoritarian regimes attempt mobilize political support through framing? Notwithstanding the effective use of repression, the principal thrust of this paper is to investigate how the regime maneuvers political discourse to attempt to justify itself and foment political support. The strategy of framing, then, consists of examining the repertoire of tactics, rituals, and conceptualizing mechanisms that give meaning to the communication the regime maneuvers to secure various forms of political support. While every regime devotes a certain amount of effort to “make itself look good,” in the absence of open and democratic elections framing becomes an indispensable legitimizing tool for Communist regimes in the battle for people’s hearts and minds. This is specially the case in Cuba, where most of the population is young enough not to have a recollection of the economic disparities and political instability that characterized the Republican years. Besides the arbitrary use of repression, authoritarian regimes have few other effective strategies to boost their grassroots political mobilization. Needless to say, tight controls over the media and education are two of the many resources such regimes manipulate to facilitate the articulation of strategic communication. As Misztal (1985, p. 146) has persuasively argued, the mechanisms of control in Communist regimes range from the distribution of welfare gains to the more pervasive infringement on human values. In addition, there is increasing evidence to support Przeworski’s (1991) conclusion that with time the official ideology becomes ritualized and devoid of popular meaning in Communist countries. This makes the craving for legitimacy even more prevalent, and investigating the manifestation of this type of soft power in nondemocratic regimes is a fascinating question for a number of reasons. First, mechanisms of framing reveal the hearty capacity of the state to produce and reproduce its image for public consumption. One can argue that the success of the politics of framing throughout the revolution is a contributing factor to the longevity of the regime in the midst of recurrent internal and external crises and mounting popular discontent. Second, how states attempt to legitimize their rule after intense crises also reveals their adaptability and reengineering capacities. Proving wrong most pundits’ calculations about its survival has become a trademark of the Cuban government. We witnessed some evidence of this resilience after the regime rebounded from the social devastation generated by the economic hardships during the Período Especial and more recently with the speculations surrounding the implications of Castro’s emergency surgery and his decision to transfer power, for the first time, to his brother Raúl. It is fair to say that no state, including Cuba, can survive for more than four decades by unleashing repression alone. Third, depending on how a frame is devised, the politics of framing can also conceal normative contradictions that could exacerbate tensions within the regime’s highest circles and between the state and society. Since its inception, the revolutionary government has been keenly effective in concealing internal drifts and in presenting a unified public image. However, there is evidence to suggest that the gap between political rhetoric and reality is increasingly becoming a source of popular discontent, particularly among the younger generations with no recollection of the Batista regime or the insurgency that battled it. At one point, young people on the island privately characterized Fidel as “the Ayatollah” mainly for his frequent public aberrations and unwillingness to loosen his tight grip on power, but also for his many unrealized flamboyant claims and messianic promises. In popular music, Carlos Varela symbolically depicted this generational gap in the song Guillermo Tell. While the regime’s crafty communication strategies justify the study of framing, in the context of Cuba, it is remarkable that until now very few scholars have systematically studied its political effects. Perhaps part of the reason for this is the unquestionable double standards of the regime when it confronts such issues as human rights, accountability, the rule of law, or democracy, which fill the pages of books and other studies about the revolution during the last four decades. Another possibility for this intellectual vacuum might be the difficulty of assessing how the politics of framing is actually crafted in such a tightly guarded and reclusive environment. For instance, we know political messages must receive the blessing of the highest officials in Cuba before they are made public. But how policy is formulated remains an enigma. Fortunately, we can follow a fairly reliable methodology to uncover not necessarily how framing is crafted or its concomitant social impact, but instead the tactics and mechanisms through which frames are communicated by the regime. This approach consists of conducting a content analysis of Fidel’s speeches at the ceremony commemorating the 26th of July celebrations. The 26th, as is commonly referred to in Cuba, is one of the most important annual festivities celebrated by the regime. In addition, it presents an opportunity for the regime to deliver what would be comparable to the State of the Union address in American politics. Analyzing these speeches reveals what the regime wants the world to know about itself and how it rationalizes the twists and turns it planned for the revolution. Moreover, the speech has been conceived as a vehicle of “direct democracy,” the true form of political participation embraced by revolutionary leaders. The 26th celebration constitutes one of the most venerated and colorful public gatherings since it was first instituted in 1959 and the impact of the 26th speech transcends time and the public event itself. The symbolism and magnitude of this celebration make the 26th speech an ideal source of information to depict how the regime wants others to perceive it and how it depicts its own reality. I borrowed the theoretical framework guiding this study from the groundbreaking work of Erving Goffman (1974) on frame analysis and from the contentious literature on power (Isaac 1987; Lukes 2005). According to Goffman, frames are all about the organization of experience. Situations are structured according to values and norms subjectively defined and interpreted by participants. Social frameworks in particular involve rules and postulates about what is acted upon within the frame and about what should be left out. Primary frameworks3 consist of the social norms and principles that give meaning to experiences. As I hope it is obvious, in the case of Cuba it is in the interest of the regime to take an active part in the task of giving meaning to popular social experiences. The capacity of individuals to construct their own reality is significant because this social construction precedes social action. In other words, individuals behave according to how they perceive their experiences. The logical assumption is that the more effective the regime’s articulation, the more support it will foster. Thus, one can say that when an autocratic charismatic leader unchallengedly constructs, delineates, or defines reality, and these meanings permeate the political culture, the act of framing becomes another manifestation of this power because the leader has the ability to manage and manufacture “the mobilization of bias” and the third dimension of power4—the expectations that cognition and preference subordinates will employ to interpret or reference their own reality. Furthermore, since autocracies do not provide space to officially articulate and diffuse rival schemas, the word of the leader amounts to a primary reference, a most subtle and sophisticated manifestation of social control. The leader’s language conveys norms, values, and principles that permeate the human consciousness particularly among those with a predisposition to validate his message.5 Hence, framing becomes one of the most effectives and sophisticated latent manifestations of political power because it is transmitted through unrestrainedly enthusiastic experiences and collective identities without the threat of negative sanctions or coercions. In a recent Washington Post report, the Cuban poet Pablo Armando Fernández put it succinctly when he said: “Fidel will always live in the minds of Cubans. He is electric—like a messiah” (Washington Post 2007, A14). More specifically, to examine the power of frames in Cuba I analyzed the collection of speeches of Fidel Castro published by the Cuban Government listed on the official government website www.cuba.cu/ gobierno/discursos, between 1959 and 2006. Throughout my analysis I searched for evidence of how five recurrent primary frameworks attempt to legitimize political power within the revolution. The first two, (1) the call for justice and a just society and (2) the evidence of social affluence, I borrowed from Oberschall’s (1996) pathbreaking study of the composition of frames during the demise of former Eastern European Communism. The rest of the frameworks are prominent features in most Cuban official discourse. These I shall call (3) the making of history and the exuberant depiction of the revolution as a unique social process; (4) the victimization of the revolution under constant siege from internal and external enemies; and (5) the need for personal sacrifice in support of the revolutionary process. Having established the analytical design of the paper, I interpret the 26th of July celebrations as the ritual where these five primary frameworks are aired. Behind the celebration, this public occasion also reveals how one-sided and controlled this interactive ritual actually is. As I shall argue, the celebration amounts to a theatrical production that mimics the horizontal organization of authority throughout the island. I discuss the configuration of the five cornerstone frameworks delivered by Fidel between 1959 and 2006 and interpret the much-discussed 26th celebration speech delivered by Raúl in 2007. I conclude by discussing the implications of these speeches portend about recent events in the island. Another tactic intended to signal a new departure in Cuban politics was the assembly itself. The 26th marks the beginning of controlled mass demonstrations where the regime employs controlled political mobilization to support its position on issues and intimidate opponents while presenting an appearance of voluntary and democratic popular participation. The regime goes to great lengths to conceal the sophisticated mixture of incentives, favors, and pressures it maneuvers behind the scenes to gather such a crowd. While early on during the revolution many people probably attended these celebrations out of self-interest, curiosity, even perhaps enthusiasm, as years went by the celebration became another obligatory ritual performed to gain personal concessions favors from the regimes, or simply avoid being labeled a gusano. The event itself can hardly be characterized as a form of democratic participation or even interaction. The 26th speech itself has always taken the form of a monologue delivered by one of the Castro brothers, preferably Fidel, to signal they are solely in command. Since there are no rebuttals, the Castros are in complete control over what is said and how it is said: the framing process. A study of the 26th speeches from 1959 through 20068 reveals how the revolutionary generation, and in particular Fidel Castro, time and time again reiterates his vision of the revolution and its place in world affairs. The speeches rarely outline major policy shifts; in fact, during times of crisis, as in 1989 and 1990, a substantial portion of the speech was dedicated to the many achievements of the revolutionary government.9 In 1990, for instance, as one would have expected, Castro highlighted the achievements in the education and health sectors and then stated how Cuba compares favorably with other countries in Latin America and the rest of the Third World even in the midst of trouble times. Another significant characteristic is the free use of the collective “we,” nosotros, throughout his discourse. This usage has two significant political connotations. The first is the apparent depersonalization of the revolution. Every achievement is presented as the result of a collective effort that translates into an apparent sense of empowerment to the average citizen. Second, forging a collective identity is an essential tool to control popular mobilization since it encourages citizens to defend what is theirs, the revolution, and any efforts calling for a different course is seen as intrusive, possibly threatening, and something that must be eradicated. Of course, in retrospect this prediction could not have been more off the mark given the adverse effects on the real standard of living conditions the country experienced during the 1980s and 1990s. But sacrifice also took on the meaning of alliance. It was important given the early contention of the revolution for the revolutionary government to sell a pledge of support for the cause. References to making history are also more frequent early on than after the 1970s. In time, the idea of making history gradually progressed from practical allusion to historical figures as a strategy to link the revolution with the nationalistic struggles of the past, and starting in 1993 every speech mentioned it was not just to commemorate another Moncada anniversary, but also to invoke Carlos Manuel de Céspedes and other leaders of the insurgency against Spain in the 19th Century. Conceptual transformation is the second conclusion that can be drawn from the trend analysis. The symbolic meaning of terms seems to have changed over time to conform to historical circumstances. 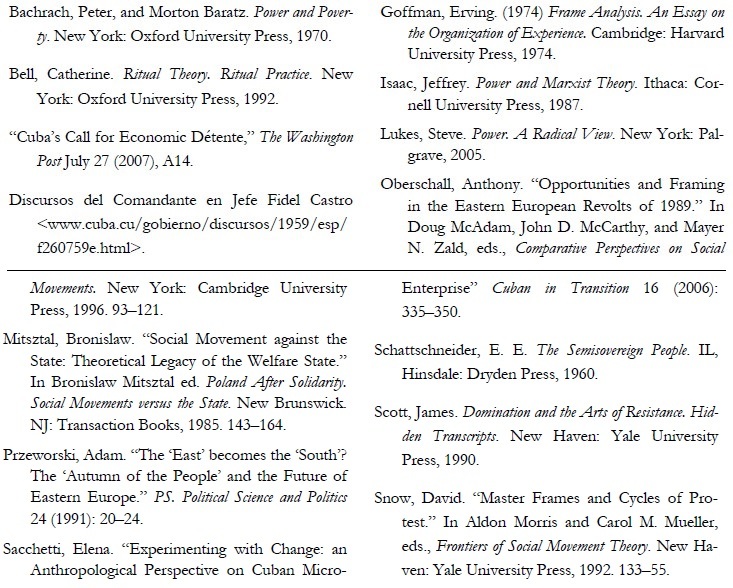 References to how democracy is practiced in the revolution not only became less frequent after 1965 but also the word democracy was rarely used, referring instead to other modes of political participation. In fact, during the last decades whenever there was a direct reference to capitalist democracy, it was to underline how it did not work as intended, serving special interests and the powerful and affluent at the expense of the ordinary citizen. Another remarkable illustration of the dynamic of conceptual transformation was evident in the 1960 speech when Fidel, to characterize the historical contributions of the revolution, claimed that before the revolution various public services did not work and people were not treated with dignity or respect. He credited the revolution with changing all that, stating “Antes no había honradez; antes no había, como hay hoy en nuestro pueblo, amor; antes no había, como hay hoy en nuestro pueblo, compañerismo y confraternidad profunda; antes no se abrían las casas en la ciudad para recibir a los del campo, ni se abrían las casas en el campo y en los pueblos del interior para los hombres de la ciudad….” A constant feature of the speech has always been the historic achievement of the revolution to have survived years of hostile aggression by the United States and its allies, especially as manifested in the embargo. The result is that these primary frameworks reveal the dogmatic operational code of the first generation of revolutionary leaders who are reluctant to concede failure or to change the course. This is very problematic because it is evident they conceive a threat from any position that would deviate from the course they set up for the revolution and dare challenge their authority and policy judgment. In practical terms, this means that they are unwilling to contemplate sustained reforms. This is the reason that revolutions do not radically change until the first generation of leaders, and particularly the primary leader, is long gone from power. When one compares other nations that have gone through Communist reforms, China and Vietnam, with Cuba, it is evident that the more distant reforming political elites who are still nominally Communist are from the experience of fighting a revolutionary insurgency war, the more this group is willing to preside over significant openings and reformist policies that seem to deviate from the revolution’s original course. Raúl alluded to the historical making of the Cuban people as part of a long struggle dating from the nineteenth century wars of independence. He tied the continuous popular struggle to resistance to the recurrent misguided aggression by the United States. This was a clever way of mixing two primary frames alluding to nationalistic pride. He cited the evidence of current nationalism by referring to historical national heroes—Martí, Maceo, Agramonte, Céspedes, Mella, and others. He referred to the 3,478 Cubans who felt they were victims of direct or indirect attacks supposedly sponsored by the United States. Raúl also went to great lengths to credit the resilience of the Cuban people and their personal sacrifice in overcoming what he called bureaucratic mistakes of the past and the embargo, which aggravated the effects of those errors. The people’s personal sacrifice was paying off in the surmounting of bureaucratic and international obstacles against socialism in the island, he concluded. En tal sentido estudiamos actualmente lo referido al incremento de la inversión extranjera, siempre que aporte capital, tecnología o mercado, para así aprovechar la contribución que esta pueda hacer al desarrollo del país, sin repetir los errores del pasado por ingenuidades e ignorancia en esta actividad y a partir de las experiencias positivas, trabajando con empresarios serios y sobre bases jurídicas bien definidas que preserven el papel del Estado y el predominio de la propiedad socialista. As on previous occasions, the 26th speech was seen as an opportunity to state the new identity and potential new course of the revolution. It is precisely this new identity that has been the topic of much debate and speculation on what the future will bring to the island nation. Critics of the regime interpret this stance as a “band-aid” measure accomplishing too little too late to save socialism in Cuba. More sympathetic pundits see the speech as signaling a longawaited opening for a more pragmatic phase of socialism, perhaps the beginning of a course similar to the rise of market socialism witnessed in China today. The reality, however, is further from these two positions. Raúl seems to be signaling a muddling-through strategy of development similar to the tentative reforms China, and especially Vietnam, incrementally instituted after their revolutionary leaders left power. The path chosen by Raúl should not surprise any serious student of post-Communism in developing nations. It is evident that, as was the case with Viet Nam and China, Raúl will follow a tentative approach that will consist of small reforms intended to satisfy potential allies and reassure hardliners of his commitment to revolutionary ideals. Sustained reforms among Communist regimes come only after such revolutionary leaders as Castro, Mao, or Ho Chi Minh step down or die and the younger generations manage to consolidate their grip on political power. New generations of leaders base their legitimacy not on the survival of revolutionary traditions but on changing them. This generational change has obviously not happened in Cuba yet; hence the guarded tone of Raúl’s announcement and the brevity of his statement. As was stated earlier in the paper, examining the articulation of primary frames gives us a clue to the reengineering capacity of the revolution. Recently, as the revolutionary fervor levels off, some would even say dwindles, the 26th speech has dropped recurrent references to distributive justice and a just society. References to personal sacrifices seem to be connoting popular resilience and heroism. In many respects, Raúl’s 26th speech follows the trend of the 2006 speech, the last one delivered by Fidel, which enthusiastically states copious details about how much the revolution has accomplished to improve the daily life of the country while it stands firm against external enemies. The call for social solidarity these days has also taken a back seat in these proclamations. But more importantly, frames do not only reveal the capacity of the revolution to reinvent itself every so often. These tactics set the policy agenda and define popular perceptions and expectations, and as such they manifest a third dimension of power. This does not mean that this is the only strategy designed to amplify the regime or that it works well all the time. However, the fact remains that until recently Cuba has been holding back on sustainable reforms at a time when other former Communist regimes have been moving toward increased liberalization. This situation calls attention to the effectiveness of discursive mechanisms of legitimation as a strategy that complements outright repression to achieve political allegiance. This paper examines the 26th of July celebration speech as a social act intended to construct an image and rationale to sustain the continuous survival of the revolution. Primary frames reinterpret the condition of the island and often make references to nationalistic instincts to present the revolution as a dynamic ongoing process with a long historical path. This strategy obviously hides the fact that, politically at least, the Cuban revolution is no longer as revolutionary as it claims. From 1959 to 2007, five strategic frames organized the 26th speech. Taken together these are intended to reinforce popular obedience and subordination by framing the revolution as a process of collective consciousness rewarding revolutionary fervor and personal dedication. Framing strategies are another attempt to leverage the communicative power of the revolution in a similar fashion to what James C. Scott has called public transcripts (Scott 1990, 19). The third dimension of power is as effective as any other because it sets the subjective framework to, at least in public, interpret the new course the revolution will follow as it attempts to reinsert itself in a world marked by the effects of globalization. 1. I gratefully acknowledge the comments of my colleagues Joseph L. Scarpaci, Jorge Pérez-López, Juan del Aguila and Mauricio Solaún and assume all responsibility for the exposition of the ideas herein. Since I presented this paper, I learned of the passing of my aunt Linda in Cuba. I dedicate this paper to her memory and celebrate her enduring indifference to the 26th of July speech. 3. According to Goffman, a primary framework “is one that is seen as rendering what would otherwise be a meaningless aspect of the scene into something that is meaningful” (Goffman 1974, p. 21). 4. E. E. Schattschneider (1960) contends that the mobilization of bias reflects the capacity of political organizations to include and exclude certain issues of the public discourse. 5. This conclusion follows Bachrach and Baratz (1970, pp. 43–44) when they write “political systems and sub-systems develop a ‘mobilization of bias,’ a set of predominant values, beliefs, rituals, and institutional procedures (‘rules of the game’) that operate systematically and consistently to benefits certain groups and persons at the expense of others. Those who benefit are placed in a preferred position to defend and promote their vested interests.” For a discussion of the third dimension of power see Lukes 2005. 6. The Moncada Attack was carried by Fidel and his followers on July 26, 1953 and marks the beginning of their armed struggle against the Batista dictatorship. The attack against the army garrison failed militarily but it was later the source of much political gains for Castro. 7. 26th of July speech 1959. All of the references to the 26th speeches are taken from those cited in the Granma database unless otherwise indicated. 8. It is worth noting that the database does not contain speeches for the 26th of July celebrations in 1992, 1994, 1997, and 2001. Presumably, his brother Raúl headed these celebrations while Castro was traveling overseas. 9. A rare exception is the 1993 speech that decriminalized the dollar and outlined significant policy shifts. 10. 26th of July 1989 speech. 11. For a recent account of how personal ties and reciprocity enables individuals to maneuver the risks and opportunities of the informal sector, see Sacchetti (2006). 12. 26th of July 1966 speech.